CLEVELAND – Miguel Cabrera hit a two-run homer and Max Scherzer retired 22 straight batters after the first inning, leading the Detroit Tigers to a 5-1 win over Cleveland on Tuesday night to stop the Indians’ winning streak at five and trim their lead in the AL Central. Cabrera’s laser shot in the sixth inning off Corey Kluber (3-3) helped the Tigers win for just the second time in six games. The defending AL champions also moved within 11/2 games of the first-place Indians, who have won 18 of 23 since April 28. Scherzer (6-0) gave up two singles and a run in the first before shutting down baseball’s hottest team for eight innings. The right-hander walked just one and struck out seven, including the final four he faced. Scherzer’s 118th and last pitch was his fastest — a 98 mph heater to strike out Drew Stubbs. “He knew that was going to be it for him,” Tigers Manager Jim Leyland said. ORIOLES 3, YANKEES 2: Nate McLouth homered leading off the bottom of the 10th inning and Chris Dickerson hit a pair of solo shots as Baltimore snapped a six-game losing streak with a win at home. McLouth hit a 1-1 pitch from Vidal Nuno (1-1) into the bleachers in right-center to give the Orioles their first win since May 12. Jim Johnson (2-4), who blew three save opportunities during the six-game skid, got three straight outs in the 10th. His performance capped an exceptional effort by Orioles pitchers, who retired 21 of the last 22 New York batters. ATHLETICS 1, RANGERS 0: Rookie right-hander Dan Straily pitched seven scoreless innings and Yoenis Cespedes homered as Oakland won its fifth straight game, beating Texas and Yu Darvish at Arlington, Texas. Straily (2-2) gave up only two singles while facing 22 batters, just one over the minimum for his seven innings. He struck out five. Darvish (7-2) had won all five of his previous starts this season when pitching after a Texas loss. Even with consecutive wins to start the three-game series, Oakland still trails the Rangers by 4½ games in the AL West. RAYS 4, BLUE JAYS 3: Kelly Johnson and Desmond Jennings homered, Alex Cobb won for the first time in three starts and Tampa Bay won at Toronto. Cobb (5-2) allowed one run and three hits in 61/3 innings for his first victory since winning at Colorado on May 5. The right-hander walked two and struck out two. Thirteen of his 19 outs came on grounders. REDS 4, METS 0: Mike Leake (4-2) pitched three-hit ball for seven sharp innings and Cincinnati parlayed star third baseman David Wright’s early error into a win at New York. Devin Mesoraco homered as the Reds won for the ninth time in 11 games. They scored three times in the first inning after Wright let a bases-loaded, two-out grounder skip through his legs. PHILLIES 7, MARLINS 3: Delmon Young homered and Ryan Howard added three hits and three RBI to help carry Philadelphia to a win at Miami. Tyler Cloyd (1-0) allowed two runs and eight hits in seven innings. He was recalled from Triple-A Lehigh Valley (International League) earlier in the day. 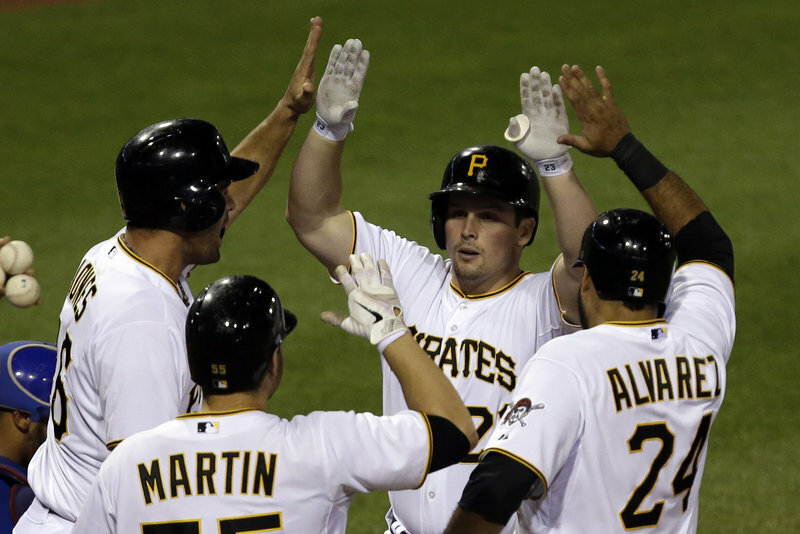 PIRATES 5, CUBS 4: Travis Snider hit a pinch-hit grand slam during a five-run sixth and Pittsburgh spoiled a strong return to the mound for Matt Garza with a win at home.